Cardiovascular alterations in the thyrotoxic patient are attributed to hypermetabolism and the need to dissipate the excess heat produced, which results to increased circulatory demands. While sinus tachycardia, atrial fibrillation and congestive heart failure with long-standing atrial fibrillation are well-recognized cardiovascular manifestations of thyrotoxicosis, the occurrence of pericardial effusion due to thyrotoxicosis is rarely reported. We report the case of a 32-year-old Filipino woman in the 23rd week of her fourth pregnancy, with a seven-year history of a gradually enlarging anterior neck mass associated with palpitations, exophthalmos, heat intolerance and easy fatigability. She was treated as a case of thyroid storm on initial presentation at the emergency room, with a baseline FT4 of 40.2 pmol/L and TSH of 0.1 uIU/ml and subsequently discharged. She developed exertional dyspnea, 3-pillow orthopnea and bipedal edema without associated chest pain or fever, days after discharge. Echocardiogram on readmission revealed massive pericardial effusion in tamponade. Her FT4 upon at this time was within normal limits. Immediate pericardiostomy was done. Pericardial fluid was negative for mycobacterium tuberculosis or any bacterial isolates. Serum ANA was likewise negative. 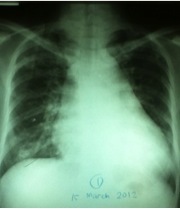 After initial pericardiostomy and treatment with anti-thyroid medications and prednisone, pericardial effusion resolved. A repeat 2decho upon follow-up showed no residual effusion. To date, there are no published cases in the Philippines on thyrotoxic pericardial effusion. In a thyrotoxic patient with worsening heart failure symptoms despite adequate treatment, it is prudent to consider a pericardial effusion, to facilitate timely management. Kahaly G, Dillmann W. Thyroid Hormone Action in the Heart. Endocrine Reviews. 2005. 26(5):704–728. Sampana A, Jasul G. High Grade AV Block Complicating Hyperthyroidism: A Case Report. Philippine Journal of Internal Medicine July-Septemner 2010; 48:2. Braunwald E, Fauci AS, Kasper D, Hauser HL, Longo D, Jameson JL. Disorders of the thyroid gland. In: Braunwald E, Fauci AS, Kasper D, Hauser HL, Longo D, Jameson JL, editors. Harrison’s principles of internal medicine. 15th ed. Vol 2. New York: McGraw-Hill; 2001. p. 2069-73. Ovadia, S, Lysy y L, Zubkov T. Pericardial effusion as an expression of thyrotoxicosis. Tex Heart Inst J 2007; 34:88-90. 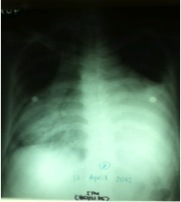 Teague E, O’Brien C, Campbell N. Pericardial effusion and tamponade complicating treated Graves’ thyrotoxicosis. Ulster Med J 2009; 78 (1) 56-58. Levy PY, Corey R, Berger P, Habib G, Bonnet JL, Levy S, et al. Etiologic diagnosis of 204 pericardial effusions. Medicine (Baltimore) 2003; 82: 385-91.